Thank you all for your thoughts on running, yesterday! All your motivational stories and wisdom boosted my confidence and made me feel so happy. As ridiculous as it sounds, I am so grateful to have you all in my life. I feel like we are all best friends! Today was a rest day for Couch To 5k running, so I did an old cardio VHS my mom has. It’s Tony Horton’s Power 90 Sweat Cardio 3-4. It’s an amazing workout, never fails me. I felt so old fashioned as I put it in, since it’s a video not DVD. My how times have changed. I was dripping with sweat when the work out was over. The word smoothie grosses me out lately, don’t ask. Breakfast was a smoothie shake. Probably one of the most delicious green monsters I’ve ever had. And it was huge. Yes, I drank it all. I tend to fall into food ruts. So it’s no surprise that lunch was a complete replica of yesterday’s tuna sandwich. Yum. 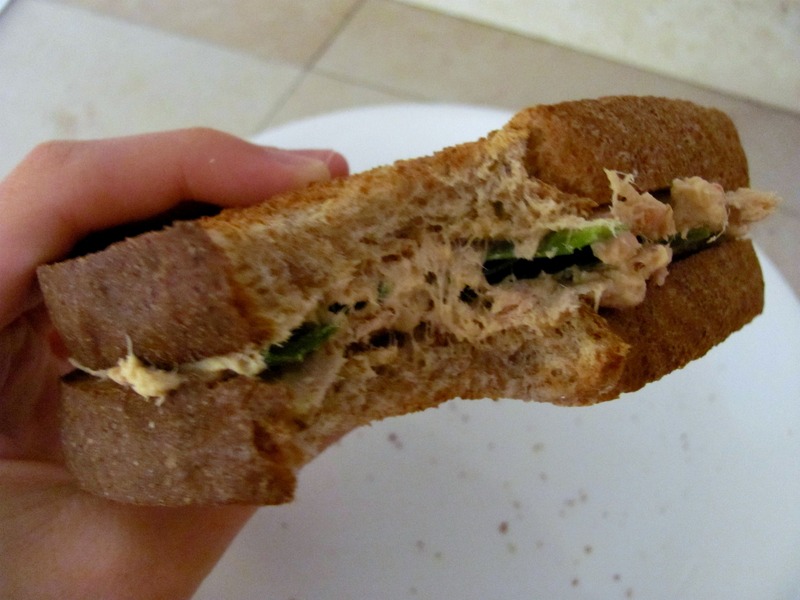 Tuna + hummus + spinach on toasty bread. What more do you need in life? I have horrible acne. You wouldn’t know it by looking at pictures of me, I always cover up with make up. But I realize that when I eat better, my skin clears. I’ve been avoiding dairy I think it’s really bad for my skin. The only thing I miss is Greek yogurt! I hate cow’s milk, I can’t even drink it straight, so that’s not a problem. But I have found a new love for unsweetened almond milk. I love the taste of it! I also need to be better at eating 100% sugar free. I used to do really good, but lately I’ve been slacking and only eating maybe 65% sugar free. Sugar flares up my acne real bad. Tomorrow I’m doing week 4 of Couch To 5k with three of my friends. We’ve been getting together every Saturday morning for the last few weeks to run. Right after we do that, there’s a youth basketball tournament at the church that I am very excited about! I love basketball! Q. Do you find certain foods are better/worse for your skin than others? Q. What sports do you play with your friends? Haha! Glad I’m not the only ones who still uses VHS tapes from time to time. Sometimes I do my Mom’s “8 Minute Abs” videos and they are soooo old fashioned, but they work! That’s awesome that you worked out with a VHS!! I have terrible problems with acne as well. I’ve been trying to figure out what I can adjust in my diet to help clear things up. I’ve been thinking about going gluten too not only for the sake of my skin but also because I have a lot of headaches that I think may be caused my gluten. I’m having trouble getting started going to gluten free. I love bread and gluten containing foods way too much!! Same here! And I know there are lots of gluten free bread options, but they’re more expensive plus my family doesn’t want or need to go gluten free so they’re not going to shell out the extra money for me to have gluten free products. I think I’m just going to start eating LESS gluten. Like, a serving or less a day. Yummy-sounding green monster! Yeah, dairy always gives me pimples too. It’s no fun, and I really miss Greek yogurt. Good luck with the gluten- and sugar-free thing! Yay for church basketball games! Ours were in February and March, but we did volleyball instead. Dairy made my skin yucky! But I no longer miss it thank goodness. I’ve always had pretty soft skin though. I have bad acne too. I have cut down my dairy a lot, and have really grown to love Vanilla Almond Milk too! Have you tried Laury’s Oatmeal mask? It worked really well for me. I have also been putting Extra Virgin Olive Oil and Honey on my face too (about 10 minutes each). I haven’t been doing it too often, but I think if I did it more, I would really see a difference. Oh, I remember you posting about the oatmeal mask! I think I’ll try it tonight! Thanks! You put olive oil and honey on your face? How much? go vegan!!! great for da skin!! i actually have never rly had skin problems.. so evn when i went vegan not much changed!! but i have heard dairy can do that– havent heard it with gluten though.. i think thats only if you have stomach pains! I SHOULD go vegan! It’s just, all the food I would need to eat/buy would be expensive and I would* *have to pay for it, because my family isn’t going to buy me almond milk, tofu, avocado and all the vegan things I would need. 😦 Plus, I don’t think meat is my problem, just dairy! I still have my VHS player!! Haha! It used to take so long to rewind tapes! My friends and I often play ultimate frisbee or water polo which is fun. It’s more to play water polo in an outdoor pool versus indoor though. dairy, gluten, and sugar are all bad for the skin……I’ve never had skin problems before (thank goodness!) But I definitely think it is because I eat foods good for my skin 🙂 My skin always feels better after I eat good fats like pb, nuts, coconut, and avocado! I reduced my dairy intake for lent, but I didn’t see improvements in my skin until I revamped my skincare regimen with my dermatologist and got a clarisonic cleanser. The one thing that I did notice is less dairy = less bloat = abs! I couldn’t totally give up my greek yogurt and cheese because I enjoy it too much. I don’t really play too many sports. I like to hike with my husband or play softball for fun. Ooh, strawberry avocado! Great idea, I need to try that! I have never realized a correlation between the healthy fats and my complexion, so I’m going to try and start paying better attention, see what I notice! I get in food ruts too. If something tastes good, I just want to eat it over and over again! I love tuna and hummus. It’s the best together. My acne is the worst. I just try to eat healthy and wash my face immediately after I work out so it doesn’t get any worse. for me, foods dont have as much as an impact on my skin as stress or not getting enough sleep! i think getting enough healthy fats does WONDERS for my skin though! Sugar and stuff generally doesnt bother my skin too much, there don’t really seem to be that many foods that irritate it. Lately I have been getting some pretty bad skin issue too! But I think it might be hormone related rather than diet related because I am pretty much eating the way I always do. But I am considering leaving out certain foods each week just to see if they affect my skin. And btw, tuna with humus is one of my favorite combos! So good on crispy bread! For me, the worst things for my skin are sugar and coffee (acidity). Ever person’s body reacts to different foods in different ways, so it took me a long time to figure out what the biggest triggers for my skin are. Old workout videos are the best! I found a kickboxing one at a yard sale for a quarter that I love doing occasionally – I spend the whole time laughing at the 90s workout clothes. Too much sugar & not enough veggies definitely messes with my skin. It’s a hint to me to clean up my diet when my skin gets that way. I think it’s so cool that you’re doing the couch to 5k program. I’ve never considered myself a runner, but you’re really inspiring me to look into it! I found that ever since going vegan, my skin has never been better. I don’t know what it is, but the dry and oily patches are now gone! I think having a healthy diet overall makes a difference. Plus it makes my body feel much more energetic, too. My friends and I do yoga together. Hehe, we’re cool :). you know, I have never until this moment thought about mixing hummus with tuna to make tuna salad. and i’m so pumped about it now, because mayo makes me gag so I’m always that weird kid who passes up on the tuna, chicken, or egg salad anywhere. I think the tuna, hummus combo is now on my official list of things to try. YOU WILL LOVE IT! 🙂 I have had a tuna/hummus sandwich everyday for the last 3 days, and now I’m all out of hummus! So delicious. I also did canned salmon, which was amazing. OMG I have a ton of my mom’s old VHS tapes still! haha love it! My boyfriend and I actually play hockey together….I’m from Minnesota, playing hockey is a given! I’ve actually heard it’s a UNproven theory that your food affects your skin to a great extent. Interesting, no? I love playing field hockey with my friends. I still miss it! Hmm… that’s interesting. I wonder if I’ve had any diet changes in the last year ’cause I’ve noticed some skin changes this past year. Definitely worth looking into, thanks for the idea! 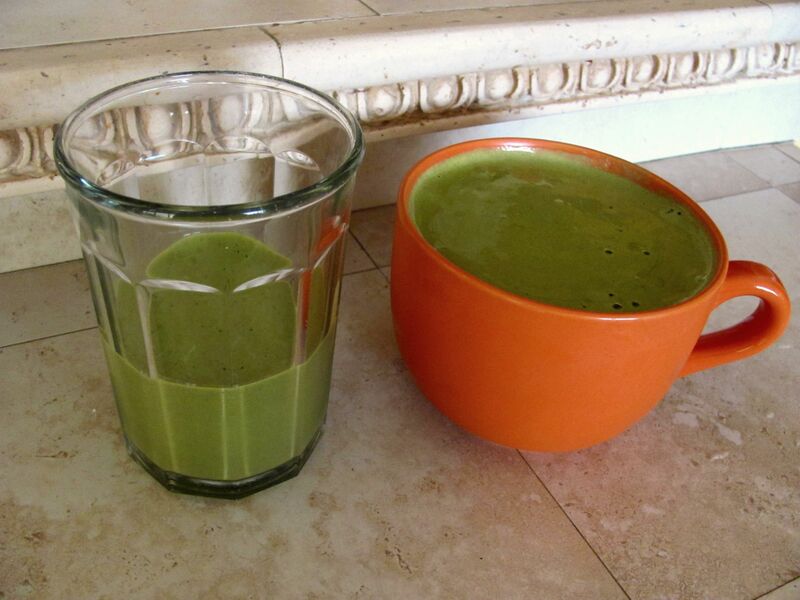 Your green shake/smoothie looks delish! I don’t really find any food affects my skin in a negative way, but fresh food definitely makes it brighter – tuna and spinach are GREAT, so you’re on the road to glowy-ness 😉 I’ll have to try the hummus w/ tuna too! Kayla, what website do you use to make your headers? They are always so cool! Thanks! I downloaded a free software onto my computer called Paint.net. I have been using it for the last 3 years, I love it and recommend it to everyone!